The full soundtrack to heavy-metal tribute Brutal Legend has been unveiled, and, says the game's music director, it'll "kick your f***ing teeth in." It's no secret that we here at Chez Escape are rather looking forward to playing as Jack Bla - er, Eddie Riggs, running around a heavy metal fantasy world and making things explode with A.) a massive axe and B.) the power of rocking out. As one would expect, such an awesome game would deserve an equally awesome soundtrack. Well, Gamedaily has the complete setlist, and metal fans should definitely be happy with what we've got. A quick run down the list reveals names like Anthrax, Black Sabbath, Dethklok, Dragonforce, Judas Priest, Kiss, Megadeath, Motley Crue, Motorhead, Ozzy Osbourne, and unsurprisingly - given the star of the game - Tenacious D. And that's just some of them. 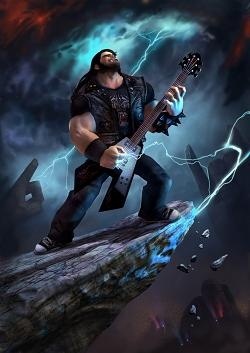 "This soundtrack took years to put together as we wanted to represent every genre of Metal, and also have the perfect music for every epic moment in the game," says Brutal Legend mastermind Tim Schafer. "It's designed to be loved by Metal fans, and for those who are not, it will either convert them or make their heads explode ... or both." The game's music director, Emily Ridgeway, sums it up more succintly: "It's metal. It's the best. It'll kick your f***ing teeth in." Brutal Legend will hit shelves on Rocktober 13th for the Xbox 360 and PS3.